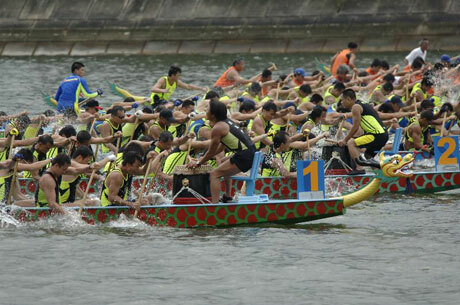 Dragon boat racing is a popular sport in Hong Kong which has an estimated 30,000 active paddlers. During 2019, Hong Kong hosts major international and local dragon boat festivals, including the traditional Tuen Ng dragon boat races on 7th June at various locations and the three-day Hong Kong Dragon Boat Carnival which features the Hong Kong International Dragon Boat Races at Central Harboufront on 14th to 16th June 2019. TSUEN WAN - Tsuen Wan Dragon Boat Race 2019. 26th May 2019. Off Tsuen Wan Promenade, Tsuen Wan, New Territories. 8am to 5pm. Admission free. CHAI WAN - Eastern Dragon Boat Race in Celebration of the 22nd Anniversary of the Establishment of the Hong Kong Special Administrative Region, 2nd June 2019 (to be confirmed), Chai Wan Cargo Handling Basin, Chai Wan, Hong Kong Island). Admission free. STANLEY - The 18th Sun Life Stanley Dragon Boat Short Course Races. 23rd June 2019. 8am to 5pm. Stanley Main Beach, Stanley, Hong Kong Island. 9am to 3-30pm. SAI KUNG - The 17th Sai Kung Summer Vigor. September 2019 (date to be advised). 8am to 4pm. Jockey Club Kau Sai Chau Public Pier, Sai Kung Promenade, Sai Kung, New Territories. Admission free. SHAU KEI WAN - Shau Kei Wan Dragon Boat Competition 2019 and King of the World Dragon Boat Competition 2019, 6th October 2019. 8am to 5pm. The promenade at Aldrich Bay (Shau Kei Wan Typhoon Shelter), Shau Kei Wan. Hong Kong Island. Admission free. KWUN TONG - 21st Hong Kong International Dragon Boat Championships. 25th to 27th October 2019 (Fri - Sun). Kwun Tong Promenade. The Dragon Boat Festival (Chinese Duanwu Festival) is a lunar holiday, occurring on the fifth day of the fifth lunar month and known locally by its Cantonese name Tuen Ng. This festival is a significant holiday celebrated in China and the one with the longest history. The name for the festival in China was originally the Upright Sun Festival but this was changed by foreigners to the Dragon Boat Festival, notably for the dragon boat races, held particularly in the southern provinces, Hong Kong and Macau where there are many rivers and lakes. This festival commemorates the death of Qu Yuan, a popular poet and minister who is said to have committed suicide at the age of 35 by drowning himself in a river on the fifth day of the fifth lunar month in 277 B.C. Qu Yuan was an honest and loyal minister who was held in high esteem in the kingdom of Chu (situated in the present day Hunan and Hubei provinces). When a corrupt prince vilified Qu Yuan, he was disgraced and dismissed from his office. Realising the kingdom was now in the hands of evil and corrupt officials, Qu Yuan jumped into a river. Nearby fishermen tried to save him and were unable to recover the body. Mourning the death of the poet, the people threw cooked rice so the fish would eat the rice rather than their hero. The spirit of Qu Yuan appeared in the river and said that a huge reptile in the river had stolen the rice offering and suggested that they wrap the rice in silk and bind it with threads before throwing it in the river. This later turned into the custom of eating “Zong Zi” (boiled glutinous rice wrapped in bamboo leaves) and rice dumplings to symbolize offerings to Qu Yuan. The dragon boat races represent the attempts to rescue and recover the body of Qu Yuan. 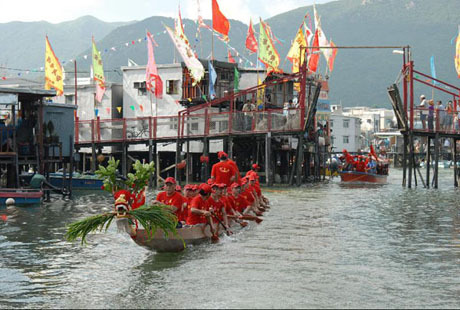 The Dragon Boat Festival at Tai O on Lantau Island is also home to a waterway praying ceremony known as the “Gods Parade” which dates back over one hundred years. In June 2011 the festival became on of four cultural events in Hong Kong to be included on China's national list of intangible culture heritage. It is said that Tai O was hit by a plague more than 100 years ago and, in an effort to drive out the epidemic, local fishermen paraded along the local waterways on dragon boats, towing behind them deity statues that they had borrowed from temples in the area. The plague ended, but the custom, known as the dragon boat water parade, has been maintained to this day. During the annual Dragon Boat Festival, three fishermen's associations, namely Pa Teng, Sin Yu Heung and Hap Sim Tong, organise a religious activity known as dragon boat water parade. On the morning before the festival, members of the associations row their dragon boats to visit four temples, Yeung Hau, Tin Hou, Kwan Tei and Hung Shing, and carry the deity statues back to their associations' hall for worship. On the day of the festival, members of Pa Teng row the dragon boats to Po Chue Tam behind Yeung Hau Temple, where they pick fresh grass on the hillside to put inside the dragon's mouth in a ritual called "Picking the Greens". In the old days, a "Drinking Dragon" ceremony was also hosted by association elders to cast out evil spirits, during which a few drops of rooster blood were mixed with Chinese white wine and then sprinkled on the dragon's head, tail and body. However, this ceremony has not been performed since the Government introduced its ban on the keeping of live chickens. The dragon boats then set out on the parade or "Gods' Parade". A small boat that carries the deity statues is towed by a dragon boat along the local waterways. Gold and silver paper offerings for departed souls are burned in the water along the way, while the residents of the stilt houses also burn joss sticks to pay tribute to the passing dragon boats. As entertainment for gods, the dragon boats engage in a race after the parade. In the afternoon, the associations host a send-off ritual in which the deities are transported back to the temples. Then everyone gathers at night for a feast to celebrate the Dragon Boat Festival in what is always a jubilant event. The "Gods Parade", is the most important part of the Dragon Boat Festival at Tai O. A small boat carrying the deity statues is towed by each dragon boat along the local waterways. Gold and silver paper offerings for departed souls are burned along the way, while the residents of the stilt houses also burn joss sticks to pay tribute to the passing dragon boats. 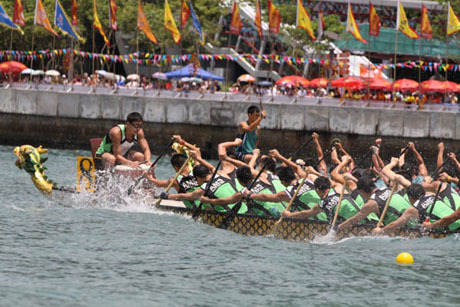 Hong Kong’s Dragon Boat Carnival, which features two major elements, the Hong Kong International Dragon Boat Races and San Miguel BeerFest will be held at its Central Harbourfront between 14th and 16th June 2019. The event was first held at its current location in 2016. 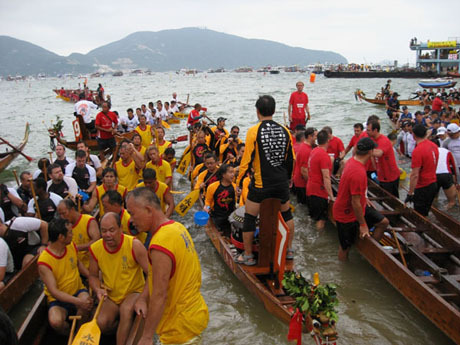 Between 2010 and 2015 the event was held at Tsim Sha Tsui East Waterfront after the organisers, Hong Kong Dragon Boat Association (HKDBA), along with Hong Kong Tourism Board (HKTB) decided to raise the profile of the races and make the carnival a “mega event” and major tourist attraction. Between 2000 and 2009 the international races had been held on the Shing Mun River at Shatin. The three-day 2019 carnival will be the 43rd anniversary of the international races The 2019 carnival is jointly organised by Hong Kong Tourism Board and Hong Kong China Dragon Boat Association. The annual regatta began in 1976 as a fishermen’s boat race involving nine local and one Japanese team and was the first international dragon boat race, setting standards which have subsequently been adopted in over 60 other countries and regions. Since its initiation the regatta has rapidly expanded and this year the races will be contested by about 5,000 paddlers from 116 local teams and 48 Mainland and overseas teams from 12 countries and regions. The SAN MIGUEL BEERFEST (TO BE CONFIRMED) is located at Central Harbourfront Event Space and is open from 1pm to 10pm on 14th June (Friday) and 10am to 10pm on 15th and 16th June 2019 (Saturday and Sunday) with beer booths and food booths, games booths and stage performances. Further details to be announced. Other events and activities featured at the carnival include a man-made beach and splash area, music concert, artisanal market with local artists works and craft products and family zone with free interactive games and activities including giant inflatable and mini rowing, roving performances by acrobatic clowns, marching bands, drummers and samba dancers, and a charity row race open to both locals and visitors. Further details to be advised. FOOD TRUCKS GALA - Fifteen food trucks will gather at the venue offering a range of local delicacies along with a San Miguel promotion (to be confirmed) where, for each single-purchase transaction of HK$60 or over at designated food trucks, visitors will be offered a "buy one, get one free" beer. The Food Trucks Gala operates from 4pm to 10pm on 14th June (Friday) and 1pm to 10pm on 15th June (Saturday) and 16th June (Sunday).